Finish your traffic school in a few minutes by breezing through the quizzes and take your time with the final exam with the reviewer below. You can finish your traffic school in a few minutes by breezing through the quizzes. It's the final exam you have to worry about. And this post got you covered. 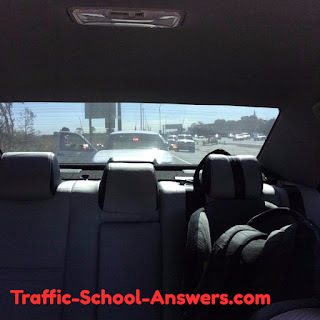 Below are 65 traffic school questions that you can reference if you find a question that you don't know the answer to. Good Luck! GoToTrafficSchool.com the internet course is the cheapest online traffic school. You only pay, when you pass the final exam and get your certificate. These were the questions that were on my exam when I took my traffic school. You can pass your online traffic school if you review these traffic school answers before you take the final exam. Updated as of January 2017. Beginning 2017, it will be illegal to use your cellphone unless it is mounted on a magnetic mount or a clip mount. If the police officer see's you talking while driving they may pull you over, and you better have a mount, so you can claim that you were operating your phone via voice control. Beginning 2016, it will be illegal to operate a vehicle with your ears covered with earphones, whether it's a bike or a motorized vehicle (car,truck). This is me getting pulled over, luckily it wasn't for speeding since I've learned my lesson after getting two back to back tickets. The questions you'll be reviewing are a compilation of traffic school questions that will appear on the gototrafficschool final exam. So if you use this reviewer while taking the test, you can reassure you will pass. Here are questions to go over, so you won't have to take that Traffic School Test Again. I have done the research and all online traffic schools are pretty much priced the same. They start you off with a low rate but charge you for the shipping of your certificate. Some only offer notary and proctored testing. The easiest site and cheapest for California is GoToTrafficSchool.com And for the referral code click or enter ANSWERS. 1. California law requires those under ___________ to wear a properly fitted and fastened bicycle helmet while operating a bicycle or riding on one as a passenger. Explanation: Because children might be playing behind parked vehicles without a driver’s knowledge, you should make a practice of walking behind and around your vehicle to check for them. 3. At an uncontrolled four-way stop, if two or more vehicles arrive at the same time, __________ has the right-of-way. Explanation: At an uncontrolled four-way stop, if two or more vehicles arrive at the same time, the driver to the right has the right-of-way. 4. Unless otherwise posted, limits are set at ________ for residential zones and business districts. Explanation: Unless otherwise posted, limits are set at 25 mph for residential zones and business districts. In areas where there are many pedestrians, driveways, and intersections, the speed limit must be lowered to ensure safety. Explanation: You are not allowed to make U-turns in front of fire stations. Explanation: You may drive to the left of a yellow line when overtaking a vehicle that is parked or going slower than your vehicle; turning left at an intersection or into a driveway or side road; or when the right side of the road is closed or obstructed. You may also drive to the left of a yellow line when carpool lanes direct you to do so (but then always enter and exit at designated spots). Explanation: When someone tries to pass you, both the law and safety require you to allow him or her to pass. The law is clear about this, and it is also the safe thing to do. Explanation: Velocitation refers to speeding without realizing it. It is easy to do as you mirror the pace of vehicles in the fast lane, and you may not notice your speed creeping up. 9. Driving with an expired license, unsafe lane changes, and failing to stop at a stop sign are given __________. Explanation: Driving with an expired license, unsafe lane changes, and failing to stop at a stop sign are given one point. 10. Statistically, the everyday motor vehicle is the number ___ cause of death among people ages 15-30 in the United States. Explanation: Statistically, the everyday motor vehicle is the number 1 cause of death among people ages 15-30 in the United States: more deaths occur as a result of unsafe driving than from any other cause. 11. ____________ are the most frequent victims of collisions between vehicles and pedestrians. Explanation: The elderly are the most frequent victims of collisions between vehicles and pedestrians, with 38% of their deaths occurring at intersections. That’s often because their ability to see and hear, and to react and move swiftly has deteriorated. Explanation: The majority of pedestrian fatalities occur when a pedestrian suddenly runs across the path of a vehicle, because motorists do not expect to have to stop at these locations. 13. ______________ is an extra lane that permits a vehicle to reach freeway speeds. Explanation: An acceleration lane is an extra lane that permits a vehicle to reach freeway speeds. 14. _______ paint on a curb means no stopping, standing, parking, loading, or unloading. Explanation: Red paint on a curb means no stopping, standing, parking, loading, or unloading. The one exception is that a bus may stop at a red zone marked for buses. Explanation: Half of all wrecks occur within 25 miles of home. That is why it is important to wear your safety belt at all times, even if you are not going far. Explanation: After completing your pass, you should return to your lane when you can see both headlights of the vehicle you just passed in your rearview mirror. Explanation: To prove your identity at the Department of Motor Vehicles, you may take your birth certificate. 18. The Basic Speed Law: establishes a 55 mph speed limit. Explanation: The Basic Speed Law requires that drivers reduce their speed if driving conditions make it unsafe to follow posted speed limits. Explanation: A Class M1 license allows you to ride any motor bike. Explanation: When you make your home in California or take a job here, you must get a California driver license within 10 days. 21. A _____ limit applies when traveling near school zones where children are outside or crossing the street. Explanation: A 25 mph limit applies when traveling near school zones where children are outside or crossing the street. As they are less predictable, slow down and give children wider space to maneuver. If there is not a safe way to steer clear of the children, stop and allow them to pass. 22. When backing up, keep your foot __________ while you shift your vehicle into reverse gear. Explanation: When backing up, keep your foot on the brake while you shift your vehicle into reverse gear. Explanation: Remain stopped as long as the red lights on a school bus are flashing. Failure to do so may result in a fine of up to $1,000 and your driving privilege could be suspended for a period of one year. Explanation: If your vehicle stalls in the middle of the roadway, you should move off roadway as quickly as possible. Explanation: Diamond lanes are reserved for vehicles with two or more people. Vehicles in these lanes are exempt at certain on-ramps from stopping at timed entrance lights. Explanation: Ice tends to form in shady areas, as well as on bridges and overpasses, which, being more exposed to the cold air, tend to freeze before other road areas. Approach these areas with caution. Explanation: Yellow lines indicate the center of a two-way road used for two-way traffic. Explanation: On a three-lane highway that designates one lane of traffic for each direction, the middle lane is used for vehicles making left turns or passing. Explanation: Do not reverse around a corner when your visibility is limited or blocked unless you have someone else directing you. Explanation: If one of your front tires blows out, the first thing you should do is hold the steering wheel firmly on a straight course. Explanation: The container must be full, sealed, and unopened if it is in the front seat. Otherwise, it must be put in the trunk or a place where passengers don’t sit. Keeping an opened container of an alcoholic drink in the glove compartment is specifically against the law. Explanation: At intersections without marked crosswalks, pedestrians have the right-of- way. 33. When the road gets rough with potholes, bumps, mud clumps, and loose sand or gravel, you should __________ to retain control of your vehicle. Explanation: When the road gets rough with potholes, bumps, mud clumps, and loose sand or gravel, you should slow down to retain control of your vehicle. Explanation: If your vehicle begins to overheat while climbing a hill, you should turn on the heater. Explanation: You should refrain from passing another driver when the driver is slowing down or indicating a right turn, the driver is looking at street signs, or the driver is traveling at or close to the speed limit. Explanation: The high accident rate of large trucks is caused in large part by fatigue. Explanation: When you see animals on the road, you should slow down and be prepared to stop. Give them space?they can be unpredictable. Explanation: Large trucks take a longer time to stop than other vehicles traveling at the same speed. The average passenger vehicle traveling at 55 mph takes about 230 feet to stop. However, a large truck traveling at the same speed can take more than 400 feet to stop. the DMV has the power to confiscate your vehicle based on the results alcohol or drug tests taken or your refusal to take such tests. you have the right to speak to an attorney before submitting to an alcohol or drug test. you can be arrested and put in jail based on the results of alcohol or drug tests taken or your refusal to take such tests. Explanation: The Administrative Per Se Law means the DMV has the power to suspend or revoke your license based on the results of alcohol or drug tests taken or your refusal to take such tests. Explanation: A truck takes more time to accelerate and brake than does a car. Explanation: Headlights should be switched on by law no later than 30 minutes after sunset. Dusk light provides general illumination, but important details can be lost unless you switch your lights on in time. Explanation: Even if you have a green light, it is against the law to enter an intersection if your way through it is blocked, because this prevents vehicles in the cross street from proceeding when the lights change. Explanation: Placing your foot over the brake so that you can brake in less time is called covering the brake. 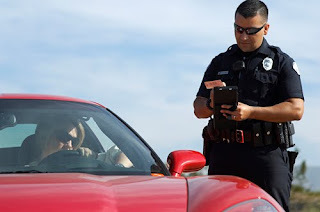 Explanation: Implied consent means that drivers agree in advance to take a blood alcohol concentration test whenever they drive in California. Explanation: It is unsafe to drive in another vehicle’s blind spot, side-by-side another vehicle, or in clusters of vehicles. Explanation: Two-lane, undivided highways have a speed limit of 55 mph. Explanation: Any driver who reasonably believes safety would be compromised without sounding his or her horn should do so. No other use of the horn is permitted. Explanation: Yellow paint on a curb allows you to stop long enough to load and unload people or objects. Drivers of non-commercial vehicles must stay with their vehicles. Explanation: Hydroplaning occurs when a thin film of water builds up between the tires and pavement and makes steering and braking practically impossible. Explanation: Liability insurance protects you against claims if you are at fault in a collision. 51. A motorist is guilty of _____ when he/she operates a motor vehicle in a manner that endangers or is likely to endanger persons or property. Explanation: Driving aggressively is ultimately leads road rage. 52. True or False? Talking on a hands-free phone is considered a dangerous driver distraction? Explanation: You could also get a ticket, if you are holding your cellphone while on hands-free mode. While not as bad as texting, talking on a cellphone will driving clearly distracts you from driving safely. Explanation: Shifting to neutral and pulling over to the side may be your best option. 54. Pedestrians are not allowed to walk on _______ unless there is a side walk more than 3 feet wide and signs permitting pedestrian access. Explanation: Pedestrians ar not allowed to walk on toll bridges or highway crossings, unless there are signs permitting pedestrian access. Explanation: According to the CDC "Each day in the United States, more than 9 people are killed and more than 1,153 people are injured in crashes that are reported to involve a distracted driver"' Below is a video of a driver texting instead of paying attentio, luckily for the driver this wasn't a fatal accident. He hit an SUV instead of a small car with a baby in the backseat. 56. Which of the following visual habits can help reduce the chances of a collision? 58. True or False? It is illegal to hang items from the rear-view mirror if they can potentially block your view of the environment. Explanation: It is convenient to hang stuff on your rear-view mirror, but it isn't safe if it blocks your view, and it can also invite potential robbers to break into your vehicle. 59. Which kind of drugs can potentially result in a driver being charged with a DUI? Explanation: You are not allowed to operate a vehicle while under the influence of a controlled substance. 60. True or False? You should activate your turn signal at least 5 seconds before passing on freeways. Explanation: You should always make sure signal for enough time, so that other drivers on the road can see you, before you passing on freeways. 61. High beams should be used instead of low beams in which of the following circumstances? Explanation: Only use your high beam when you have low visibility conditions, because other drivers can be blinded by a high beam light shining on their rear view mirror, lets be considerate of other drivers on the road. Explanation: Always adjust your speed to account for road conditions(poor visibility due to hail, rain, dust, road debris, so you don't put yourself in unsafe situations. Explanation: Always best to avoid road rage situation, recently a vegas mother of four was killed, because she choose to go after a road rager. see article here. So if that doesn't make you think twice about driving aggressively or engaging a road rager. Think again. Explanation: Always reduce your speed when exiting from the freeway, there may be a crosswalk ahead and reducing your speeding will help you avoid hiding a pedestrian. Explanation: First things first, make sure to pull over to avoid a head on collision then honk and flash your lights. Like and Share. If you've already clicked them, thank you and best of luck to you. I hope this reviewer has helped you become a better and safer driver. Driving is a privilege, one should be responsible enough to think about sharing the road with other drivers. Injuring or causing a fatal accident can be avoided by practicing road courtesy and common sense. Be safe out there and God Bless. Awesome, thanks for sharing these tips on passing the driving school test! I will make sure to study these answers so that I can pass the test. Hopefully I do well, I will be taking it sometime next week.